Over 150 stakeholders from government, universities, research institutions, local and international companies, and 13 traditional and online media practitioners participated in the Crop Biological Breeding Industrialization Seminar 2018 co-organized by the Chinese Society of Biotechnology, Chinese Society of Plant Physiology and Molecular Biology, the Crop Science Society of China, China Society of Plant Protection, Chinese Society of Agri-biotechnology, and ISAAA at the Chinese Academy of Agricultural Sciences (CAAS) in Beijing, China on July 11, 2018. Professor Zhu Zhen from the Institute of Genetics and Developmental Biology, Chinese Academy of Sciences and Professor Zhang Chunyi, Director of China Biotechnology Information Center (ChinaBIC) moderated the event. Professor Xu Zhihong, Academician of Chinese Academy of Sciences and Former President of Beijing University served as the Chairman and gave a message during the Seminar. He stressed the importance of agri-biotechnology education in China and criticized rumors about GM crops. Dr. Paul Teng, ISAAA Chair, presented the Global Status of Commercialized Biotech/GM Crops in 2017. Dr. Rhodora Aldemita, Director of ISAAA Global Knowledge Center on Crop Biotechnology reviewed the Biotech Crop Adoption in Asia-Pacific. Prof. Liu Yaoguang, Academician of Chinese Academy of Science and Professor of South China Agricultural University gave a presentation entitled Plant Genome Editing Technology and Its Application in Gene Function Research and Genetic Modification. Ms. He Xiaodan, Vice director of the Sector of GMO Safety and Intellectual Property Rights, Science and Education Department, Ministry of Agriculture and Rural Affairs explained the Safety Regulation Framework of Agri-biotechnology in China. For more information about agri-biotech development and biotech crops in China, contact ChinaBIC at zhangt@mail.las.ac.cn. 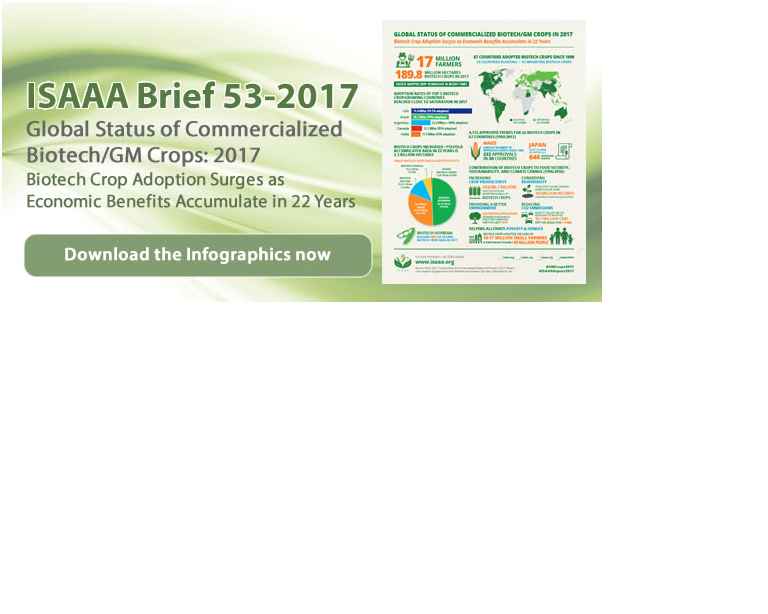 Download the Global Status of Commercialized Biotech/GM Crops in 2017 from ISAAA. Science and economics merged during The Economics of Biotech Crops: A Symposium to Promote Economic and Financial Literacy symposium held on July 17, 2018 at the SEARCA Umali Auditorium, Los Baños, Laguna, Philippines. More than 60 participants composed of scientists and experts as well as representatives from the academe, national and international agencies/institutions, partners from the biotech and business sectors, and media practitioners were informed on topics centered on the socio-economic aspect of GM crops, including the global status of biotech crops presented by ISAAA’s Dr. Rhodora Aldemita, IRRI’s research on biotech rice by Dr. Russel Reinke, the socio-economics of Bt Eggplant by Dr. Cesar Quicoy, and the social and economic impact of biofortification through genetic modification by Dr. Matty Demont. For more information on biotechnology developments in the Philippines, visit the SEARCA BIC website.